"We are very pleased with the product; it has more than paid for itself." Future applications will involve inputting data from the agents and "in-house" applications for the corporate employees." 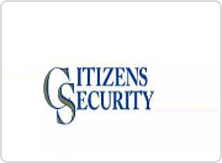 Citizens Security Life Insurance Company offers final expense life insurance, dental insurance, vision insurance, home service life insurance, preneed life insurance and other health and accident insurance. Data was prepared using existing DB/400 files and creating some new files. Several join logical files were created to allow the data to be viewed by the controlling agent as well as the writing agent. PlanetJ provided initial training and development on the first project was started - commissions statements. As stated by David Grant, Consultant to Citizens Security Life, "The speed of developing a prototype was amazingly fast. We did bog down a little with putting the final touches on the project, but this was just a learning curve of becoming familiar with the development tool." Several "hard-copy" reports have been eliminated saving the cost of printing them and mailing them to the agents. An agent voice response system (where the agent called in to get the amount of his commission check) has been eliminated. Putting production information in the hands of the writing agent and the controlling agent has allowed them to better manage their business.